Throughout his career, Pee Wee has appeared on countless recordings as a lap steel, standing steel, and pedal steel guitarist, occasionally singing live or background vocals. “Heart of Steel” is his first record as a featured artist and it has been engineered to highlight his signature instrument. With undeniable virtuosity and genius, Pee Wee brings his own impeccable timing and tastefulness to the instrument, leaving an indelible mark on the history of western swing music and the steel guitar. This record was created as a tribute to 47 years of recordings, gathered from myriad sources. The album features songs taken from two records made with The Heart of Texas band in the early 1990s and a previously unknown jazz session recorded in 1997. 7 of the 11 tracks from that session were sufficiently complete to include here. 19 studio tracks are rounded out by six live recordings, three from Pee Wee’s time with Shorty Joe and the Red Rock Cowboys in the San Francisco Bay area circa 1950, and three from his time in the late 1960s and early 1970s with the Other Brothers. In 2008, Pee Wee’s oldest granddaughter and adopted and surrogate daughter, Andie, reached out to Doug Belote, a musician her age and whose father had been a long-time musical and family friend of Pee Wee’s. Doug told her about a set of ADAT tapes that his father had left him before he had died, tapes that, as it turned out, contained the ‘lost’ jazz session Pee Wee had recorded with his daughter and Andie’s mother, DeMerris, in 1997. For over a year the tapes languished with the Belote family, Andie in Washington State and everyone else in Louisiana or Texas. In August of 2013, Andie visited her childhood home with her musical partner, engineer, and producer, Myles Boisen. Meeting up with Pee Wee and Ann Belote, Doug’s mother and Muscles’ widow, Andie and Myles retrieved the ADAT tapes and Myles hand carried them back to his studio in Oakland, California. When Andie next visited Myles, they engaged another engineer and musician, Karen Stackpole, to convert the obsolete ADAT tapes into digital files that Myles could work with. Andie and Myles had the privilege of hearing the jazz session first, before any other ears beheld them. There had been some damage to the tapes due to recording issues, a bad mic, and aging, but Myles performed his widely recognized engineering magic, manually editing out flaws that would have otherwise rendered the recordings useless. Working together to correct the speed and to edit the tracks, Myles and Andie recovered 11 tracks total, 8 of which were of sufficient quality to proceed. DeMerris had originally recorded only scratch vocals on several of the jazz standards from that session, so her vocals were recorded with engineer Yaschua Duprey-Churn of Dallas in 2016. Andie recorded her vocals in Myles Boisen’s studio that year as well, and Myles recorded guitar tracks on “Jambalaya” and “S’Wonderful” in 2015. During the process of recovering and restoring the jazz session, Andie had the idea of acquiring the masters from the western swing records that Pee Wee had made with the Heart of Texas band from engineer and drummer Rick Jones, who generously and graciously, along with all of the players, provided them for selective inclusion in what was to become “Heart of Steel”. After selecting the tracks to include from both “Good Western Swing Pickin'” and “On the Alamo”, much work still remained. The masters for “Good Western Swing Pickin'” were in yet another obsolete format, Tascam 238S, and Andie and Myles searched for months to find someone with a working machine who could convert the masters to digital format. Finally, Mr. Toad’s of San Francisco, specializing in unusual and obsolete machines and formats, was able to complete the conversions. Myles re-mixed all of the western swing tracks that were included on “Heart of Steel” from their original recordings. In the final stages of sound production, Andie and Myles spent a day with Bobby Black and Shorty Joe, and it was then that Shorty shared some live recordings he had of Pee Wee singing and playing steel guitar at the tender age of 15 on the radio in San Jose, live from Tracy Gardens. Around the same time, live recordings surfaced from the late 1960s of Pee Wee with the Other Brothers, and though the sound quality was somewhat compromised, the decision was made to include six live tracks, three from each of these two periods in Pee Wee’s career, as bonus material for the album. Again, Myles worked noise reduction and mastering magic, and the final sound recording of “Heart of Steel” was born on January 2, 2016. During the final stages of artwork production and publication, a number of delays, including a major cardioembolic stroke that temporarily disabled Pee Wee, set the production back. 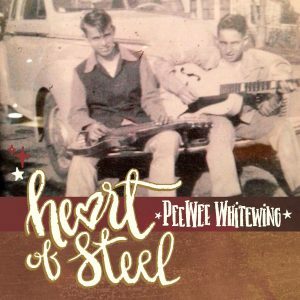 In November the delaying factors finally abated, and a final push from November of 2016 through mid-January of 2017 finally resulted in the delivery of “Heart of Steel” just in time for Pee Wee’s 83rd birthday on February 11, 2017. Click here to view a list of the artists who appear on the album, and here to view a listing of the session information for each track.